Congress President and UPA Chairperson Sonia Gandhi, while addressing a mammoth election rally at Chikmagalure in Karnataka as part of her campaign for the upcoming assembly polls in the state on Saturday, launched a blistering attack on the ruling BJP government for cheating the people and ignoring the development in the state. Chikmagalure: Congress President and UPA Chairperson Sonia Gandhi, while addressing a mammoth election rally at Chikmagalure in Karnataka as part of her campaign for the upcoming assembly polls in the state on Saturday, launched a blistering attack on the ruling BJP government for cheating the people and ignoring the development in the state. 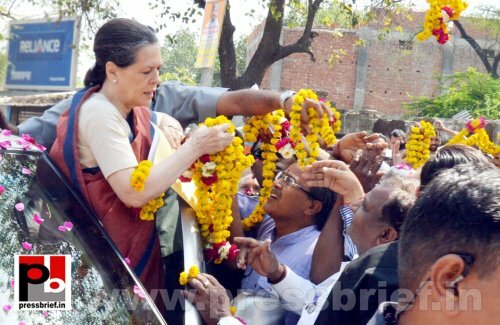 Sonia Gandhi started her address by striking an emotional chord with the people of Chikmagalure recalling how they had extended their support to late Prime Minister Indira Gandhi in 1978. “We cannot forget and we will not forget that the people of Chikmagalur, 35 years ago, lent a helping hand to my mother-in-law, Indira Gandhi, when she needed it the most. And I am here today to offer to you the helping hand of the Congress party now, because it is now you need it most” said Sonia Gandhi and the audience greeted it with huge applauds. Slamming the BJP, the Congress President stressed that the present government in Karnataka betrayed the people's mandate and claimed that the people are looking for a change. “People want change and this feeling was seen in the recent local elections.. The need for change is now and you know better, why we need a change? You live here and you are suffering because of the bad governance of the BJP” said Sonia Gandhi in her first campaign rally in Karnataka, which goes to assembly polls on May 5. "The BJP has completely betrayed the mandate of the people of Karnataka", she argued and continued “Immoral behaviour of the persons in the positions of power has crossed all limits. The law and order has collapsed. The mining mafia has destroyed the environment and has ransacked huge mineral resources, which are your property. Secular values of Karnataka society, in this region in particular, have been gravely damaged by fanatical elements only for their narrow and selfish political ends”. Sonia Gandhi added that there was a time when industries competed with one another to invest in Karnataka but the situation now is opposite. She alleged that the industries are leaving Karnataka because of corruption, government interference and poor infrastructure. Noting that Karnataka has had a glorious past and brighter future awaiting, she said this is possible only if there is political stability. Taking a dig at BJP for frequently changing the Chief Ministers in the recent past, she said “For a brighter future for Karnataka, one should realise that stability is essential. We cannot afford governments, which keep on changing Chief Ministers every now and then.. A stable Government is the need of the hour in Karnataka”. “We (Congress party) reject any communal ideology. We reject any ideology or institution that spreads hatred and disunity” underlined the UPA Chairperson. “Come out in large numbers on 5th of May. Vote for Congress; caste your votes for stability; caste your votes for a future of pride of all the people of Karnataka and Chikmagalur” said Sonia Gandhi while concluding her address.